Camille Armantrout was born in 1954 on the East Coast, first born and only girl followed by five little brothers, which is where she got her sense of humor. She began keeping journals and corresponding with pen pals in grade school and has traveled the world with her soul mate, Bob. Like so many who live in Chatham County, N.C, she is passionate about local farming and food cultures, sustainability and building community. I’ve been a friend of Camille’s, for many years, and a fan of her blog: ‘Plastic Farm Animals’ that threads together community news, personal reflection and travel stories. She and Bob host an annual ‘Hoppin’ John’ potluck party on New Year’s Day. They are greats host and I look forward to this event every year. This year at the party, I held in my hands the recent fruit of Camille’s labor, a co-authored book, Two Brauds Abroad: A Departure from Life as We Know It. 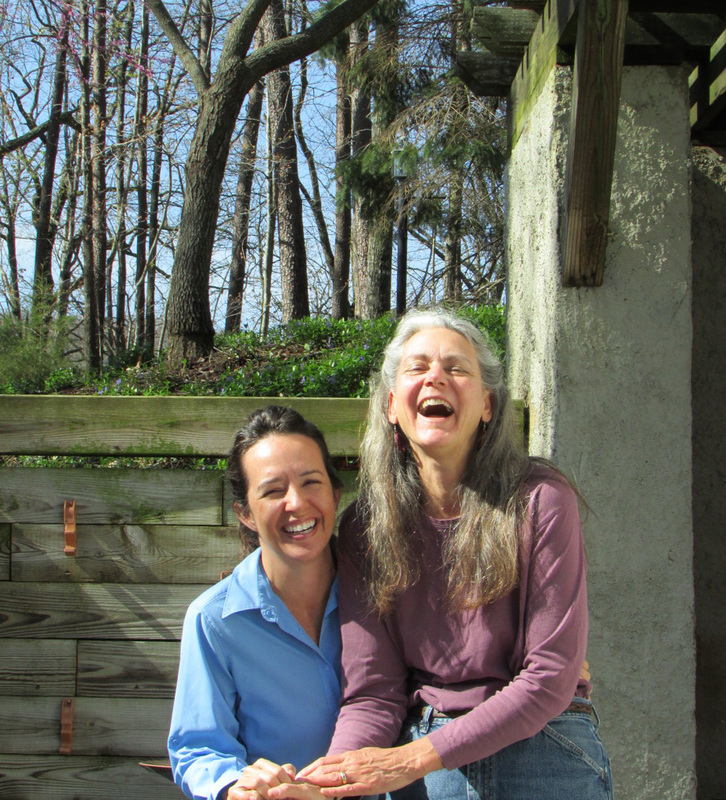 Camille and her co-author Stephanie De La Garza document the maladies, epiphanies and tragedies of their collective wisdom gleaned from traveling the world and writing to each other about their discoveries. They loved the challenges of living abroad and inspire readers to go on their own adventures. Although I knew Camille blogged, I had no idea that her passion for writing was deep in her bones. I had to invite her here to learn more. I am delighted to welcome Camille Armantrout to ‘The Practice of Creativity’. Tell us about your new book, Two Brauds Abroad: A Departure from Life as We Know It. Why did you want to write this book? My year and a half in Africa was epic. When I returned to the U.S. everyone was eager to hear about the trip, but would quickly become confused when I tried to sum up my experiences. Inevitably, I would end the attempt with “I could write a book…” and so I did. My co-author Stephanie and I had discussed writing a travel book a few times. While I was in Ghana, she was experiencing her own travel adventure in Central America, having sold her house, cars and nearly everything else to move abroad. We thought our stories would inspire others to follow their dreams. How did you get bitten by the ‘writing bug’? Did you always wish to become an author? The writing bug bit me early on. My father was a writer and I began keeping a journal in grade school. I don’t think there’s been a day of my life when I didn’t write something. In the back of my mind, I always thought I would one day transition from writer to author, and now I’ve gone and done it. What was your relationship with your co-author Stephanie before this book? What did you learn about each other in the process of writing Two Brauds Abroad? Stephanie and I are longtime email buddies. We met in Nicaragua ten years ago when she came to stay at the lodge my husband, Bob and I were managing. We enjoyed each other’s company and have been corresponding ever since. Over the years, we have shared all aspects of our lives and know each other well. Interestingly, we are two very different people. I’ve been married for twenty years. Stephanie is sixteen years my junior and still playing the dating game. I’m a vegetarian and Steph dislikes pretty much all vegetables, she’s more willing to take risks than I am, I’m more of a morning person than she is and she’s an only child while I come from a large family. As we plunged into our project, we were happy to find that we have similar work ethics and that our skill sets dovetailed nicely. I submerged myself in editing as she launched a comprehensive marketing plan. Stephanie discovered that I’m a perfectionist and I found out she has a compulsive, “Let’s do!” streak. The second half of the book is about how someone can transform his or her self into a world traveler. Where does this person start? Planning begins with a financial safety net. Decide how big your cushion needs to be and either start saving or begin liquidating assets. Next, check out the possibilities via the Caretaker Gazette, Help Exchange, World Wide Opportunities on Organic Farms (Wwoof) or similar resources. Pick a location and start reading up on the culture and climate. It’s worth noting that our transformation tips are not limited to world travel. You can reinvent yourself right here at home with a career or other lifestyle change using the same tools we offer in part II of our book. What’s on your bookshelf, next to your bed (or in your Kindle)? What are you reading right now? I am reading George Monbiot’s Feral: Rewilding the Land, the Sea, and Human Life, Little Altars Everywhere by Rebecca Wells and have just finished Rin Tin Tin: The Life and the Legend by Susan Orlean. Pay attention to your writing patterns. If you discover, as I did, that your words flow in the morning, clear your am calendar to take advantage of that creative burst. Keep pen and paper handy at all times, in your pocket or purse, on your bedside table, and in the car. Camille Armantrout has lived and worked all over the world. She is usually traveling with her co-conspirator and husband, Bob. Camille has worked in kitchens, on construction sites, driven taxi and groomed race track thoroughbreds. She bakes for fun, trains horses, and writes about the world as she sees it, here. 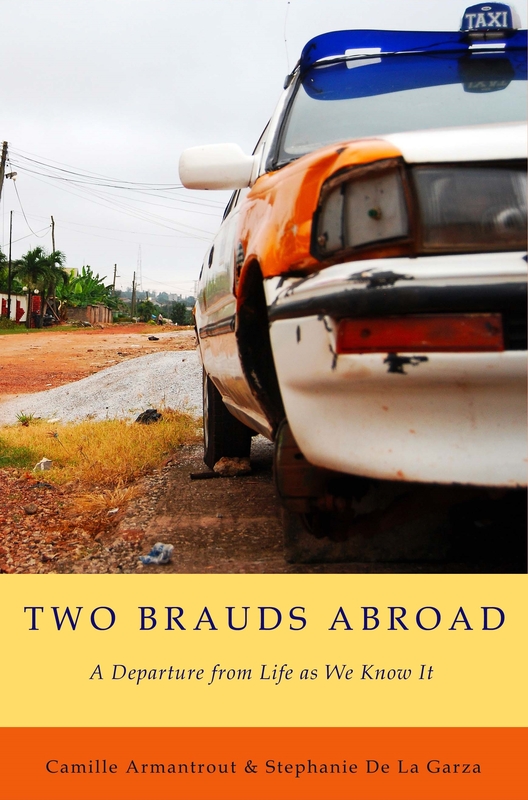 Check out Two Brauds Abroad on Amazon! 3 Responses to "Friendship and Travel for Two “Brauds” Abroad: Author Interview with Camille Armantrout"
Great interview with Camille, my co-author of Two Brauds Abroad on Michele’s website! Thanks Stephanie! Congrats on the book!